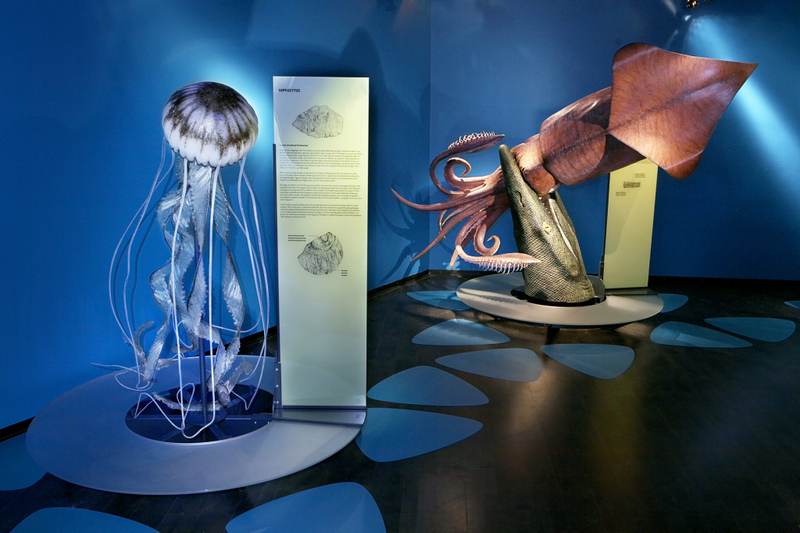 From the exhibition "Sea Monsters" on Geocenter Møn. It is awfully quiet on land. Only the noise of the wind and the soft sweeping of the sand along the beach can be heard. Nothing alive exists, no animals, no plants, no fungi, nothing. We are on a beach half a billion years ago, long before life has had time to develop into landwalking animals as we know them. But there is plenty of life underwater. It has blossomed for almost three billion years, though mostly in microscopic form as single-celled organisms. It is only recently that wildlife has taken a big step forward with single cells clustering together to form metazoic life. Now animals are for the first time able to grow into large sizes. 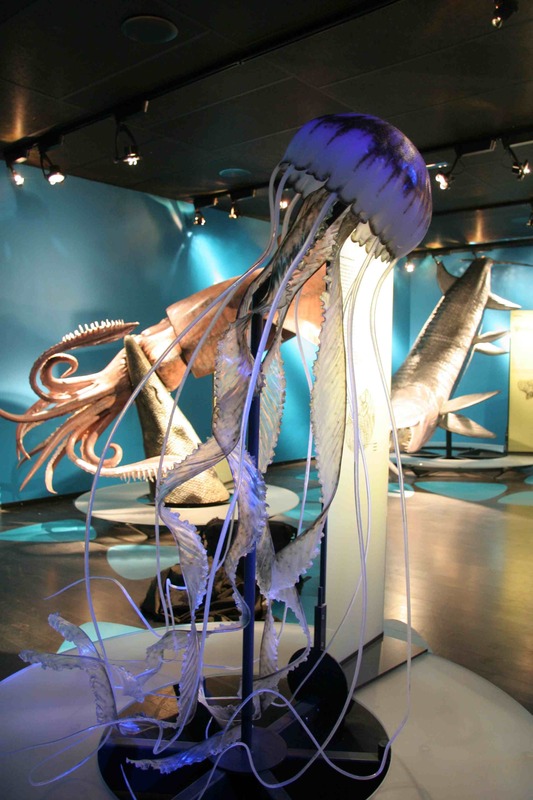 The oceans at this time are a rampant of simple life forms from jellyfish to colorful algae, simple arthropods such as trilobites and early snails. While we are strolling along the deserted beach at this time, called the early Cambrian (500 million years ago), we see one of the first dramas of the earth unfold before our eyes. Right here, just a meter or so from the roaring waves, lies a cluster of large round jellyfish of the species Hippolytus. They have been thrown up on the shore by large waves. Here they lie, exposed in the free air, pulsating silently, but without the hope of being able to move back to the life-giving water. They are not able to move their jelly-like bodies over the sand. In the increasing wind, they are buried slowly by fine grains of sand. These grains of sand will harden to a layer of fine sandstone rock containing the bodies of the fossil goplers and preserve their shapes and the fragile markings of their tentacles. Even the finest movements of the jellyfish are stored as small irregularities in the ancient sandy surface. For fossils do not lie. 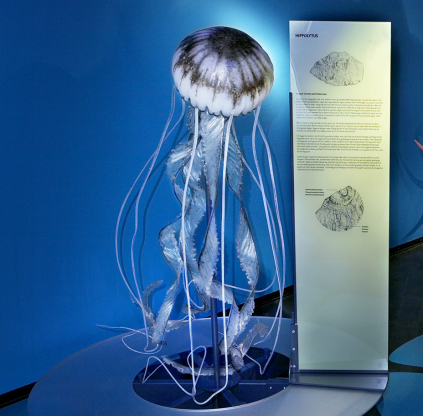 The jellyfish uses its gastro-vascular system to absorb food and to transport the nutrients around the body. These fossils show that this intestinal system was filled with sand, whereby the delicate and translucent jelly-like material in rare cases can actually leave behind fossil traces. Trailing tracks from the mouthpieces and tentacles can be seen around the body of the fossil itself. The most amazing thing is that the furrow around the imprint tells us that the jellyfish was alive when it stranded. 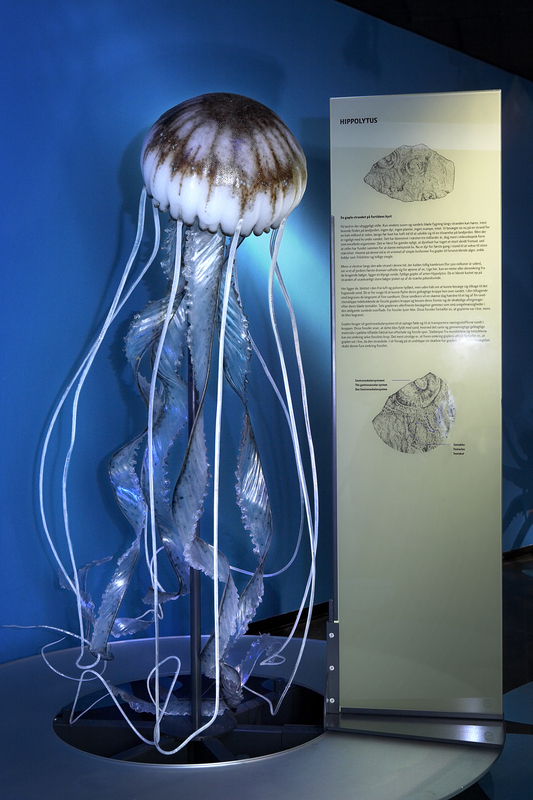 In an attempt to escape its destiny, the pulsating movements of the jellyfish have created this furrow around the fossil.